PT Tips: Why Drink Water? Water is the most abundant, yet possibly the most overlooked, substance in the body. It is impossible to sustain life for more than a week without water. It is necessary for the healthy function of all internal organs. Without water your kidneys won’t function well, your brain won’t work properly, your skin will become dry and itchy, you will get constipated, and you will have trouble regulating your body temperature. Knowing all of these things, why in the world would we not want to drink the recommended amount of water each day? Well for one thing, if you are not used to drinking the recommended amount of water each day, once you start, you may end up feeling like your back teeth are floating by the end of the day. Most articles you read recommend between 8 and 12 eight-ounce glasses of water a day, however, believe it or not, there are times when your body may need even more water. Those include but are not limited to: when you exercise, when you travel (especially in airplanes), when you are ill, when you are in a high altitude area and when the weather is warm. Athletes will find that maintaining a constant supply of water in the body is vital to optimal performance. In a dehydrated state, your muscles fatigue and may develop cramps. Pay attention to this when exercising. Do not make the mistake of thinking these cramps are caused from drinking too much water. I did this during a marathon and found myself in the medical tent immediately after crossing the finish line. In a worst case scenario, an athlete can experience heat exhaustion or heat stroke because of the body’s inability to cool itself. It is important to drink before, during and after a workout. Use a water bottle throughout the day and keep it with you. Drink a glass of water before your meals, when you are hungry, rather than after. Replace coffee, sodas and sugary drinks with water. 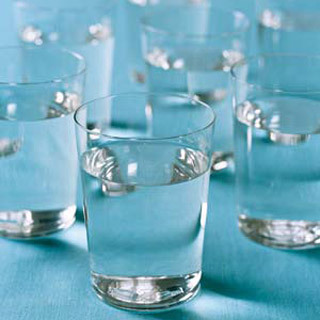 Get in the habit of drinking a glass of water during your other daily routines. The truth is most of us are not drinking enough water. Do yourself a favor and increase your daily intake. You’d be surprised at the benefits. It even helps with blogging!